These are the show notes to an audio episode. If you want to listen online, please use the direct link below. http://media.libsyn.com/media/airspeed/AirspeedCessnaMustang.mp3. This time on the show, we’re going to talk about flying a jet. But first, we’ll take a quick detour to talk about how we’re going to talk about flying a jet. I hope that Airspeed appeals in a lot of ways to a lot of people. I’ve always hoped that the primary appeal is that I’m not Mac McClellan or Peter Garrison or Jeb Burnside or even Lane Wallace. I’m a lot like the average listener. I’m a reasonably skilled and safe – but rudimentary – pilot. When I have an experience and tell you the story, I want you to be able to experience it through someone who’s a lot like you. When I fly upside down, I want you to experience what it would be – or is – like when you fly upside down. It’s more relevant and you connect a lot more with the story. So let’s talk about what I am – and am not – for a few minutes. This gets important later on. To crack my logbook open for you, I have something like 280 hours total time, about 190 hours of which is pilot in command time. The cross-country time is coming along as I build hours for the commercial certificate next year. My airman certificate says airplane single- and multi-engine land, single-engine sea, and instrument airplane, and there’s a DC-3 (SIC) type rating on there. I also have tailwheel, complex, and high-performance endorsements. I have a lot of different and exciting aircraft in the logbook. From the aforementioned DC-3 to the Ford Tri-Motor to the mighty F-16. But the larger-than-life tint that that adds to the logbook is largely a function of the aircraft themselves and my near-legendary ability to convince people to let me fly in them. Not my stick and rudder skills. And, speaking of CAP, two weeks before Oshkosh, I finished qualifying in the Civil Air Patrol glass-equipped Cessna 182T Nav III that’s based at Oakland County International Airport (KPTK), where I usually fly. I spent about 15 hours with Capt Tim Kramer, a factory-trained CAP instructor pilot, and another two hours with Maj Alex Craig, one of the Michigan Wing’s check airmen. In fairness to Tim and to me, the amount of time was largely driven by my desire to fly 50-nm legs so that the time would qualify for the commercial certificate. The new CAP 182s are all equipped with the Garmin G1000 and the GFC 700 autopilot, among other things. Although the training helped to wring out the usual issues that a C-172 driver has with the transition to the bigger, more massive, and nose nose-heavy C-182, most of it focused on the G1000 and how to fully use the system. CAP has the training focused just right. You use the avionics as little or as much as necessary to get the mission done. During much of the training, the GFC 700 had the controls from 800 feet AGL on departure to 200 feet AGL on the glideslope, but we flew it without the G1000, too, and with every level of simulated failure and partial panel in between. 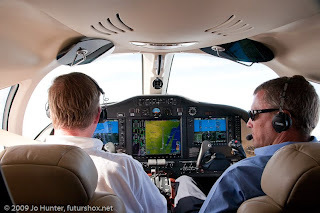 I feel completely comfortable at every level of automation and even took the airplane to Michigan’s upper peninsula and back IFR recently to prove to myself that I didn’t need a check airman in the right seat to really use the G1000 capabilities. As far as my non-aviation life goes, I have a day job. David Clark has not yet called me up with wheelbarrows full of money. I’m who you expected Alex P. Keaton to grow up to be. I worked full time as a banker and then at EDS and went to school at night full time until my eyeballs bled and I ended up with an MBA and a law degree. Now, ten years out of law school, I’m the leader of an information technology law team and an aviation transaction and finance law team at a 400-lawyer firm headquartered in the midwest. Still paying off those student loans, but pretty well established as a lawyer. I’m not made of money yet. But I might be in ten years or so. Like I suggested, all of this might seem like more information about me than you require until you consider the phone call I got in late July on the way to Oshkosh. I’m in the car loaded to the gills with camping equipment, audio and video equipment, musical instruments, shovels, rakes, and implements of destruction, and my seven-year-old son, Cole, callsign “FOD.” We had just finished taking a break visiting the Russell Military Museum on the Illinois-Wisconsin border and were back on the highway northbound when the phone rang. It was Rod Rakic of myTransponder fame and the consensus ringleader for a group of new-media personalities who were covering Oshkosh. 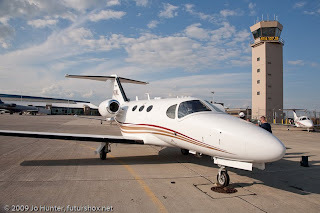 Rod said that Cessna had offered to let me fly the Citation Mustang, Cessna’s entry into the Very Light Jet, or “VLJ,” market and he wanted to know if I could make Appleton by 4:00 for the flight. Not being stupid, I immediately said “yes!” and notched the cruise control up a couple of miles per hour. I thanked Rod and hung up. Bite when you have the chance and chew later. That philosophy has gotten me a long way in stretching my boundaries. Car time is my thinking time and I settled in to think about this opportunity. And the thinking was a little unsettling. Fly a jet? Really? Me? Am I in over my head here? I mean, yeah, there’ll be a mad-skilled Cessna demo pilot in the right seat, but am I going to make a fool of myself? Or worse? And I guess this is where all that background about me comes in. Cessna – and, for that matter, all VLJ makers – focus on potential customers that are a lot like me. Pilots with advanced ratings and a reasonable amount of time in their logbooks. Probably more time than I have, but not a lot more. Pilots who want to fly their own aircraft. 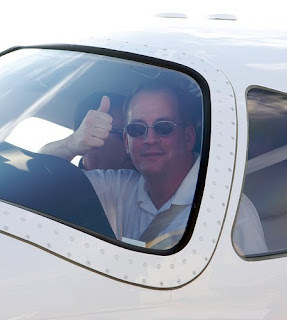 Pilots who want to fly their own aircraft single-pilot if the occasion arises. Pilots who have a need to get to faraway places with reasonable speed and who need flexibility about how and when they do that. Pilots who have the means, or might someday soon have the means, to afford a piece of an aircraft like this. And there’s the G1000 thing. 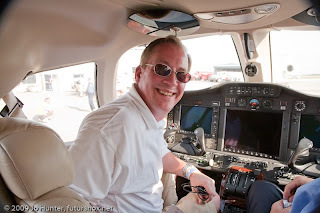 When Capt Kramer initially approached me about transitioning to the G1000, he made a point of telling me that getting glass cockpit experience would be good to prepare me for when I started flying jets and other high-end aircraft. In fact, I hear that from many different sources. Go get some glass training because it’ll be useful. You can fly more airplanes, the rental fleet is only going to get more glass in it so you’ll need it anyway before long, and you’ll be ready for transition to the more sophisticated aircraft on up the ladder. I shrugged that off at the time. 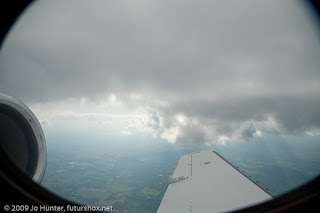 I did the G1000 transition primarily because the closest non-glass CAP aircraft that I could fly were a round-gage C-172 at Ann Arbor (KARB) and a round-gage C-182 at Flint (KFNT). Each at least 40 minutes away from my house. And the Flint aircraft would have meant another Form 5 qualify in the C-182. I really just wanted to be able to fly the Pontiac aircraft. I’m not saying that the G1000 wasn’t intriguing. It was. But the G1000 doesn’t support targeting pods or AIM-9s, so it wasn’t at the top of my mind. And flying the G1000 with a couple of turbofans behind me never entered my mind. But now I had the chance to put the G1000 training to the test. 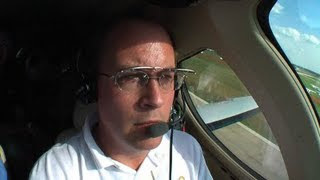 Can a guy with no more than 20 hours behind the glass really sit down in the left seat of a jet and have the C-182 glass training be relevant in a different airframe? So, yeah, I was a little daunted by the whole “fly a jet” thing. But I’m in the middle of the target demographic in many ways. 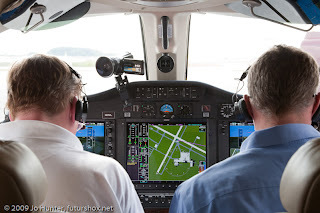 Skills, phase of life, and recent G1000 convert. Come to think of it, I was the ideal guy to fly this sortie. This would be an opportunity to put a lot of different ideas to the test. Cole and I rolled into Camp Scholler an hour and a half later and stuffed all of the camping equipment under a motor home that I dearly hoped was Mike Miley’s on what I dearly hoped was the myTransponder campsite. I stuffed a business card into the door in case it wasn’t, and then pointed the car toward Appleton. If somebody wanted the tent or a low-end electric mandolin that badly, it was theirs. I was going to go fly a jet. We pulled up to the FBO at Appleton about 40 minutes later and met the new-media horde, already in full swing with the various aircraft that Cessna had brought to the field. Rod, David Allen from The Pilot’s Flight PodLog, Jo Hunter from Futurshox, and Bill Williams from The Student Pilot Cast. They had already flown a demo in the Cessna 206 with Rod and David each taking a leg. Rod wishes to inform all of you that he greased his landing, thank you very much. I don’t usually fly at Oshkosh. 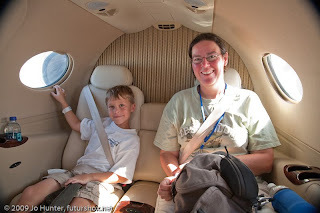 I had Cole along and media flights aren’t often the kind of thing that you can do with a seven-year-old in tow. The opportunities are usually in aircraft with a maximum of two seats. And the best ones require a parachute. So this raised an issue. What to do with Cole. I’m sure that I could have had one of the new-media guys that I’ve known well for years, and in whom I have a great deal of confidence, watch him. But this was an aircraft with enough room, twin turbofans, and a mad-skilled Cessna demo pilot in the right seat. I asked Cole if he wanted to ride along and he, like his dad, said “yes.” Bite when the opportunity arises. Chew later. I love me my boy! And this just adds to the perfection of the circumstances. This is a take-your-family-and-business-associates-places aircraft. 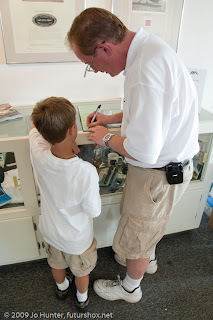 Cole was in a position to evaluate the aircraft from his perspective as much as I was from mine. He’s flown commercially, but never in a GA aircraft. He has 0.2 taxiing around in the back of a Citabria, but that’s about it. We walked out onto the ramp to see the aircraft and to meet Gordon Turner, the Cessna demo pilot who’d be in the right seat. Gordon gave us a walk-around and pointed out the features of the jet. We flew N81WL, serial number 510-165. It received its certificate in March of this year, so it was a very low-time aircraft. It’s a single-pilot certified twin-turbofan airplane. Power comes from a pair of Pratt & Whitney Canada PW615F-A engines mounted at the top rear of the fuselage near the tail root. It’ll true out at a max cruise speed of 340 knots and go to a certified ceiling of 41,000 feet with a sea-level max climb of more than 3,000 feet per minute. It needs just over 3,100 feet to take off and about 2,400 feet to land. Range is listed as 1,150 nm, presumably without IFR reserves. It has nose and tail cone baggage compartments that let you take along 57 cubic feet of stuff. It’s unpressurized, so be careful of packing that bag of chips or six-pack of Leinie’s in there, but Gordon says that that’s not usually an issue and even says that it doesn’t get very cold in the baggage areas outside the pressure hull. And you can fit skis in the aft compartment, thanks to a recess designed for that purpose. The Mustang has pneumatic boots on the leading edge of the wing and vertical fin and the airplane is certified for flight into known icing conditions. The cabin is great. Passengers have six oval windows and club seating and it’s pretty roomy back there. I has a dropped aisle, executive tables, refreshment storage, all-leather seats, wool carpeting, and toilet, among other standard amenities. The back seats have a center console with storage, beverage holders, and a standard 12-volt outlet. The front office of the aircraft is arrayed with the Garmin G1000 integrated avionics suite. As I alluded before, it consolidates all primary flight, navigation, engine and sensor data into three displays. There are two 10.4-inch Primary Flight Displays (“PFDs”), one each in front of the captain and the FO and a gi-normous 15-inch Multi-Function Display between the two. The seats and controls all feel comfortable. You feel authoritative just sitting in the airplane. You can reach what you need with no problem. I put the HD camera on the dash with no trouble and had the MP3 recorder hooked up and sitting in the left seat’s beverage holder. I didn’t have a kneeboard with me, but had the sense that I could have had the kneeboard and a grocery bag’s worth of approach and en route charts stashed within reach without making the flight deck feel cluttered. If you’re like me and you cut your G1000 teeth in the Cessna 182 or 400, things will be mostly familiar. I learned by using the right bezel of the left PFD and the left and right bezels of the right PFD. None of that in the Mustang – the other PFD is too far away. But it’s still pretty intuitive after a little time in the airplane. You’ll find that the altitude select and other knobs that you’re used to using on the left bezel of the right PFD are in a central location at the top of the panel. That makes sense because you don’t want dueling PFDs and inputs of those kinds are central to the flight so you want both the captain and the FO to be able to see the other hand going for those inputs and be reminded to double-check. And, if you’re a fan of centrally-located controls like the big red auto-feather buttons in the DC-3 like I am, you realize the value of requiring the captain to put his hand where the FO can slap it when the captain is about to do something stupid. The Mustang has a three-axis digital flight control system that’s linked to dual flight data computers. The system is compliant with the Reduced Vertical Separation Minimum (or “RVSM”) requirements for flight at or above FL 290. The engines deliver 1,460 pounds of takeoff thrust each. 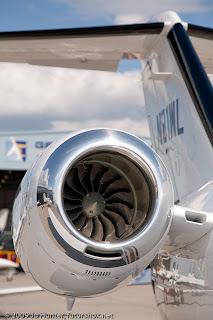 Full-Authority Digital Engine Control (or “FADEC”) makes engine operation a breeze. You simply have two throttle levers to worry about. In many ways, it’s a lot simpler than flying the average Apache. No mix and no prop to worry about. Just push or pull one set of levers. With an easily-felt detent for max cruise power. I’m sure that there are metrics that you have to monitor that we didn’t really get into on the flight, but I’m guessing that there are visual and aural annunciators that would keep you from doing anything thoughtless or stupid. The aircraft has a ramp weight of 8,730 pounds and a landing weight of 8,000 pounds. Typically equipped, the aircraft has a 5,550 pound empty weight and it can carry up to 2,850 pounds of useable fuel. Do your own math for the passengers, baggage, and fuel to divide up a useful load of 3,180 pounds. Cessna announced the Mustang program in 2002, flew the first prototype in 2005, and received the type certificate and made the first delivery in 2006. 2007 saw the first retail delivery and the granting of EASA certification. So this is still a fairly young program. The program rolled out with initial pricing at $2.29 million a copy, something like half the price of a Cessna CJ1. We loaded up and prepared to depart. Cole in one of the back seats and the others occupied by Rod Rakic, Jo Hunter, and David Allen. So it’s time to light ‘em up and launch. A couple of notes here. Gordon handled all of the ATC calls. That was fine with me. I was pretty busy otherwise. I reached for the avionics whenever I could so that I could get a real sense of how transferrable by prior G1000 experience was. I handled most of the altitude, heading, and similar changes, including the FLC, VS, and other commands and about half of the radio changes. Other than the centrally-located altitude and other knobs, I found everything pretty much where I expected to find it. I hand-flew this demo most of the time. The exceptions were during one camera reposition, the time that we spent in RVSM territory at or above FL 290, and the descent and initial approach phases so we could demonstrate the coupled approach features. But it’s the piston-driver’s hands on the controls for all of the other phases of the flight, including the takeoff and the landing. And the steep turns and the – yeah, you guessed it – stalls. But I’m getting ahead of myself. Power-up was easy. One button per engine and a stroke each way with the throttle. There’s probably a little but more to it than that by the checklist, but not a heck of a lot more. ATC had lost our IFR clearance up toward Iron Mountain and back, so we got a taxi clearance to reposition to the runway while a new clearance worked its way through the system. The airplane taxied like an Apache and was pretty intuitive. Gordon and I had a quick discussion about north-up vs. track-up, or how the MFD is configured to show our progress. If you thought there was schism between glass pilots and steam-gage pilots, you need to overhear some of the discussions I hear between north-up and track-up glass pilots. I’m a track-up guy. North-up is fine, but I need to prepare mentally a little bit so that I don’t get surprised by the display if it’s north-up. We have the flight plan set up in the G1000. 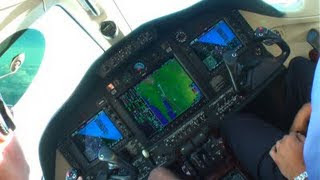 The flight director is the part of the avionics system that says what control inputs are necessary to accomplish a given course through three-dimensional space, given airspeed and other performance parameters. The flight director displays a set of bars on the PFD that give you a guide as to what control inputs to command to make the flight happen. In fact, when you give the airplane to the autopilot, you’re merely letting various servos move the controls to follow the flight director. I want to fly the airplane by hand, so we’re not going to use the autopilot just yet. Gordon points out the flight director display and reminds me to follow it. The display is the same as in the C-182T, so I have no problem figuring out what to do. We turn on the windshield heater and take care of some other preflight items. Then ground comes on with tour IFR clearance. Here’s the takeoff and the initial climb. Charging down the runway in a jet. Then we’re airborne and very quickly cleared to 13,000. We set climb power. I trim up the aircraft so that the airspeed on the tape matches up to the bug that shows me best climb. We’re heading upstairs at something close to 3,000 feet per minute. Gordon asks about Cole. Cole’s in good hands back there with Rod, Jo, and David. I gave Cole a quick lecture and stuffed a Sic Sac into the pocket of his cargo shorts, but pretty much relied on the others in back to explain anything that he didn’t understand. 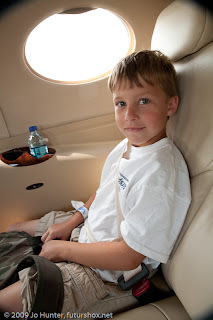 His eyes got a little wide when he first heard the gear horn in the stalls, but Rod explained what was going on and that phase quickly became Cole’s favorite part of the flight. Side note: Cole is growing up with a severely distorted view of the world. He believes that it’s normal and common to drop by an airport that we’re passing and go ramp-fly whatever’s on the flightline. He’s used to seeing airshows from the EAA Radio balcony or the air boss’s trailer. I also have a real estate broker license that I use on occasion to help other lawyers in the firm buy homes. So he also thinks that it’s perfectly normal to take a Saturday afternoon and go walk through people’s houses when they’re not home. I don’t think he realizes that these walk-throughs are prearranged with the other broker. Consistent with the view of the world that I’m mostly responsible for building up for him, Cole walked onto the jet like it’s something he does every day. After buckling in, he pulled out the retractable table, opened his backpack, and solemnly arrayed his toy tank and trucks on the table. Satisfied, he grabbed a Diet Pepsi out of the cooler and sat back, dangling a shoe from his toe, to see what further amusement might befall him. With a look on his face that said, “someday it will please me to remember even this.” No confidence issues with the boy, that’s for sure. He and I will have a conversation someday about what’s normal and what’s not. But, then again, if he’s in the back of a jet, I’m in the front of a jet. And at the controls. I need to have that conversation with myself at some point, too. In the meantime, let the magic come on thick and strong. For him and for me. Okay, back to the flight. We’re cleared to FL 230. After a frequency change, I’m futzing with the G1000 and note again that the knob I’m looking for is at the top center of the console and not on my PFD. Gordon notices and, further, notes where it would be on the PFD of, say, the Cessna 182 or 206. It’s pretty clear that he understands all of the G1000 implementations and, more importantly, understands what I’m seeing as I discover the minor but important differences in this implementation. Okay, here’s another first for me. We’re passing through 18,000 feet, the boundary of Class A airspace. Every student pilot knows that you reset your altimeter to the standard 29.92 in Class A. But very few ever have occasion to actually do it. A display blinks to remind us of the impending change and Gordon points out a simple way to reset the altimeter. I can’t resist leaning back and calling over my shoulder into the cabin, “Gentlemen, welcome to the Alpha.” That’s a good feeling. We’re stabilized and in the en route climb, so now is a good time to review a couple of things about the display indications to make sure that all is right with the systems. Gordon explains a few other things about the FADEC and the amount of automation that’s making things this easy. Then we get re-routed from Iron Mountain to K.I. Sawyer, which is fine because we’re just out for the demo and we don’t intend to get all the way to the putative destination. ATC comes on the frequency to announce a convective sigmet and Gordon takes the opportunity to display the weather on the big 15-inch display. I ask Gordon about his job flying for Cessna. That turns the conversation to the ease of operation of the aircraft and the redundancy of the systems. 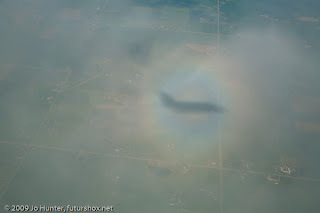 I confess that I wondered about what single-pilot certification really meant. I can imagine an aircraft achieving whatever Part 23 requires for single pilot operation while still having that be a hell of a workload for that single pilot. 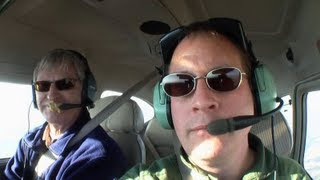 For that matter, I have a personal rule that I won’t fly single pilot in IMC without a two-axis autopilot, even in GA aircraft that are naturally intended for single-pilot operation. But, flying the Mustang, I’m a believer. Granted, I’d want a lot more familiarization and it’d require more time in the logbook, additional training for this aircraft, and a slightly gullible insurance agent, but I can tell you from having sat in the left seat and flown this airplane that I’d feel comfortable setting out single-pilot IFR cross-country (and I mean cross-country) in this airplane. Gordon has to take care of a number of peripheral things about which he’s not troubling me, but I see everything he does, I understand most of it, and I’m convinced that it would be completely doable to get to that level of confidence with the airplane. As we prepare to cross FL 290, we have to give the airplane to the autopilot to comply with RVSM requirements. Because we have the flight plan already loaded into the G1000, this is a matter of pushing a the AP and NAV buttons and George has the controls. Another thing that just doesn’t happen in piston singles. Identifying visually by paint scheme and airframe the airplanes that are up there in the Alpha. 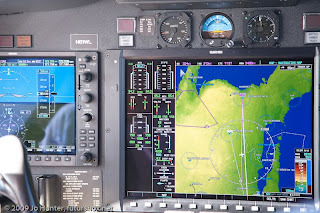 We get to FL 300 and Gordon explains the power settings, fuel consumption, and other performance measures. We’re basically flying the airplane to specifications to see that it does what the brag sheet says it’ll do. Anyone who’s spent much time flying more than a few thousand feet above sea level is familiar with the divergence between indicated airspeed and true airspeed. That’s because there are fewer air molecules per unit of volume to ram into the pitot tube. Up here, the difference is huge. You can be indicating 210 knots and, at standard temperature and pressure for the altitude, you’re doing 340 knots true. And, given that the speed of sound at standard conditions at 30,000 feet is about 590 knots, we’re doing better than Mach 0.5. We set up for cruise and get a vector for Green Bay to set up for maneuvering. Neither Gordon nor I can readily recall the ICAO identifier for Green Bay, but that’s no problem. The MFD is like an outboard brain and quickly gives us the ID. We call up and get a clearance to go maneuver. The initial descent is to FL 240. We initially roll the airplane with the heading bug and then kick in full NAV and let the autopilot get us going to the maneuvering area north of Appleton. I’m running the G1000 with Gordon’s suggestions. We’re going to begin the descent. The autopilot has the navigation. I just need to manage the power so we don’t overspeed the airframe. We also let ATC know that we want to crank and bank in a block altitude around 15,000 feet. We set up the airplane for 200 knots and get ready for the steep turns. And here come the steep turns. Flopping the wings back and forth in the transitions. I hit the “big red button” to turn off the autopilot and crank her over. I get the bank angle about right. Gordon manages the power for me. I gain and lose a little altitude here because I’m not used to the control pressures. But that takes care of itself by the time I do the third turn. Cole’s having a bunch of fun in the back and I’m having a great time up front. We go right into the stalls. The first is straight on. The second is in a 20-degree bank to the right. The third is with a pitch-only recovery. 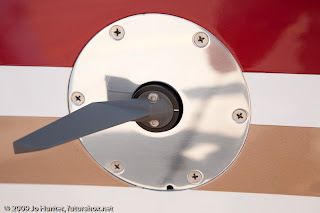 The Mustang has free-swiveling angle-of-attack (or “AOA”) indicator on the right side of the fuselage. The aircraft integrates input from the AOA indicator, airspeed indicator, and other instruments and inputs and calculates a stall speed that shows up as a little donut on the airspeed tape. With other aircraft, it’s a guessing game. Once the stall horn comes on, you just wait for the stall. In the Mustang, you know within a knot or two when the stall is going to happen because that donut on the airspeed tape is right on. Two things. First, in the turning stall (the second one), I really had to pull. I was reluctant to roll in too much nose-up trim. For obvious reasons. I’d rather have to pull too hard to initiate the stall than push too hard to break the stall. But the pull on that second stall was more than just my left arm could deliver. A little help from the right got the job done. Second, I flew the first two stalls like a piston driver. I was reminded of something that I’d learned in my primary training that I hadn’t had a chance to observe until now. You know how they say that a piston airplane is better to have in conditions like those in a microburst or in a departure or arrival stall? It’s because firewalling the throttle delivers thrust right now. Turbofans don’t work that way. The engine has to spool up before you get the kick in the pants. So, at the break, I firewalled the throttles and then was a little mystified when nothing happened in the power department. Sure, I got power momentarily. But not immediately. You’ll be able to see me ramming the throttles forward in the companion video. Also, I pushed the nose over a little more than necessary on the first two stalls. I’m not ashamed of that. Having the “push” instinct is an excellent survival trait for a pilot. But you have to push a little more gently in an 8,000-pound airplane like the Mustang, especially if you’re close to the ground and you have a few seconds to wait before you start getting the commanded thrust from the engines that will power you out of the descent and keep you out of the Wal-Mart parking lot. The last stall illustrated the positive effects of a slightly less dramatic pitch input, saving altitude that could be precious in an inadvertent stall with less than the 14,000 feet of altitude that we had under us. I should also note that I floated the cabin on at least one of the first two stall recoveries. I’m not embarrassed, but I’m not proud, either. Cole, on the other hand, thinks I’m a superhero. On the descent, Gordon had me demonstrate the speed brakes twice. Once in a regular descent profile and once in a simulated go-around, on the latter of which the speed brakes automatically retracted. Nice to have one less thing to worry about when you’re going around. We’re cleared for the approach and we have the autopilot flying vectors in heading mode in preparation for the ILS approach. We’re going in visually, but Gordon wants to demonstrate the localizer and glide slope capture features of the system. ATC calls traffic and we get the traffic visually. But the Mustang’s Traffic Collision Avoidance System (or “TCAS”) identifies the traffic with a moving yellow circle on my PFD at the traffic’s position out the window and you can hear the aural alert, too. Okay, here’s the part where I disengage the autopilot and land a jet. Yeah, land a jet. We’re stepping down the airspeed until we’re 110 KIAS over the fence. Gordon reminds me that I have both audio and video running in the airplane and that the landing will be recorded for posterity. No pressure or anything. I’m pretty darned happy with that landing. Slight crosswind and everything. On short final, the airspeed tape was frozen at 110 KIAS. Just painted on. 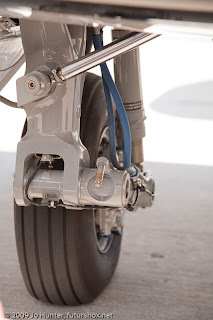 The Mustang has trailing-link landing gear, which go a long way to making any landing better and the airplane is wonderfully responsive at low airspeeds. But I’ll take some credit for that landing. The Mustang lands kind of like an Apache or a C-182. Only not as nose-heavy as the C-182. It’s a balanced and graceful experience all the way through the roll-out. The only slightly embarrassing part was when we had turned off and begin to taxi. I’m not saying that the transition to the C-182 from the C-172 had made me shy about whacking a nosewheel or bending a firewall, but Gordon said that I could stop flaring. I looked down to find that I still had the yoke back in my chest. Hey, at least they didn’t have to change out the nose gear for the next flight. We parked the airplane and piled out, but not before Jo and David shot a few pictures of me thumbs-upping from the left seat. After the debrief, we walked back in to Max Air and I had a chance to do something that I’ve wanted to do for a long time. I pulled out a brand new Jeppesen pilot logbook that I’ve been holding on to for a few months. I called Cole over, wrote his name in the front of the logbook, and filled in the first line with the details of the flight, commenting, “First flight with dad.” He can’t count it for a rating or anything, but he now has a logbook that he can begin filling in for himself someday soon. First time flying the boy, and it was great for both of us. Cole gave a favorable review from the back. His favorite part was the stalls and the steep turns. I can’t help but say that they were my favorites, too, second only to the landing. Everyone else also seemed to enjoy the experience. It was easy to move around the cabin and David in particular shifted around a lot to shoot video. The video itself tells the story of the quiet cabin environment and the comfort. As for me, the flight answered a lot of questions. Yes, a guy with most of the attributes of Cessna’s target market can fly this airplane and fly it well. I hand-flew most of the demo and the airplane responded in intuitive ways. Handling was really no different from an Apache or C-182. In fact, the landing and slow speed performance were as good or better. Anyone who’s spent time behind the Garmin G1000 will feel immediately at home in this cockpit. Sure, some things are in different places, but the huge 15-inch MFD more than makes up for it and you get the hang of the differences in placement after only one or two times reaching for the knob in the wrong place. The other differences, primarily in the MFD interface, are things that I could easily see figuring out with just a few more hours in the airplane. Plus, Garmin makes available simulator software for all of the cockpits in which the G1000 is certified, so you’d have plenty of time to practice and play with it in the relative serenity of your local Starbucks. The bottom line is that everything I’ve heard is true. A reasonably competent GA driver can fly this airplane safely and effectively. The G1000 knowledge will transfer almost seamlessly. Passengers love the airplane. And, at 340 knots true with a 1,000-plus-mile range, this airplane could be a valuable business and personal transportation tool. Thanks much to Gordon and the rest of the folks at Cessna for the opportunity to fly this demo. Thanks to Rod Rakic and myTransponder.com for coordinating this and other demo opportunities for members of the aviation new media community. Bloggers, podcasters, and other new media mavens make these experiences immediate and valuable because we cover experiences like these from perspectives that our audiences find compelling and relevant. In fact, we live and die by that relevance. It’s the ultimate meritocracy. If we’re not compelling and relevant, we don’t have audiences. And, to the extent that we do have audiences (and some of us have pretty big ones), those audiences contain the opinion leaders, movers, and shakers most worth moving by our words and images. Additionally, we have the luxury of giving a story as much depth and detail as we think it needs. An hour or more long and more than 6,000 words of script? No problem for a podcaster. Whatever it takes to get it right. No limits of time, column inches, pages, or anything else. The story gets to unfold as it needs to. Not everybody gets this, but Cessna sure seems to and we’re all grateful for the opportunity to do this coverage. Thanks also to David Allen of The Pilot’s Flight PodLog, who shot video, and Jo Hunter of Futurshox, who shot stills. Check out myTransponder.com, The Pilot’s Flight PodLog, The Student Pilot Journal, myflightblog.com, and other new media outlets for coverage of Cessna and other aircraft from Oshkosh 2009. 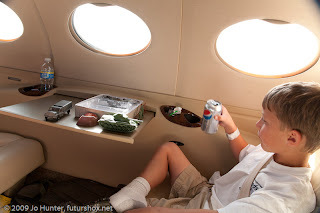 More information about the Cessna Citation Mustang is available at http://www.cessna.com/.